Here are some photos from my Lumix point and shoot. It is a very cheap camera and handy for taking touristy scenery shots. It fits in the pocket and I just leave it on Automatic and press the button when I see something on my walks. This is Gum Swamp at Forbes. 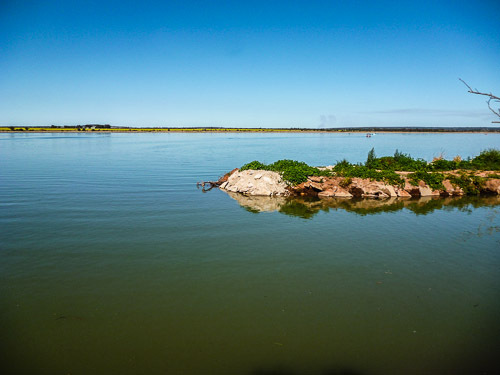 There are a few White-bellied Sea-eagles nesting out in the middle in a big tree. The panorama feature on the Lumix is quite handy. I use this the most. No wind, blue skies. Late afternoon glass-off. The wake-boarders loved it! 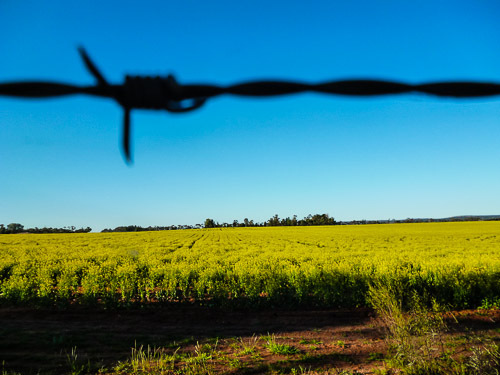 I love the colour of the canola fields. I cannot stop taking photos of them. The yellow and blue are complementary colours as well. Bonus! 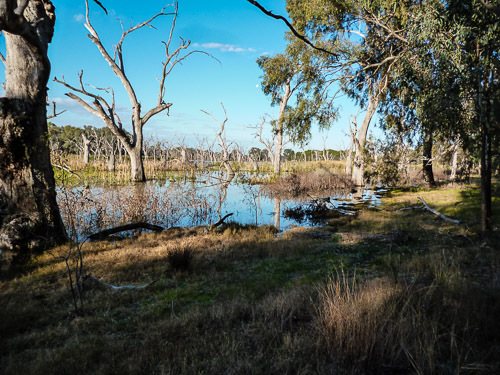 Once again at the Narrandera Wetlands. 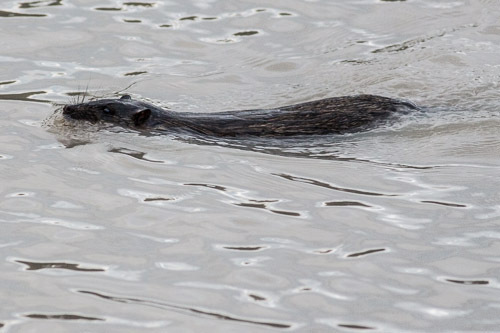 In the late afternoon I saw the Water Rat again. The Water Rat or Rakali, is an Australian native rodent which lives in burrows on the banks of rivers, lakes and estuaries. Making more mistakes again. Mis-identifying these Yellow-rumped Thornbills for Yellow Thornbills. But the stripes on the forehead give them away. 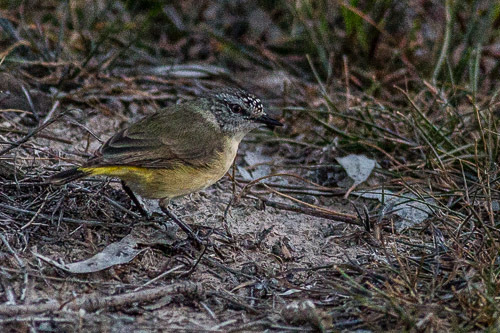 They are the largest thornbill with a white eyebrow, black crown with white spots, pale eye and bright yellow rump. 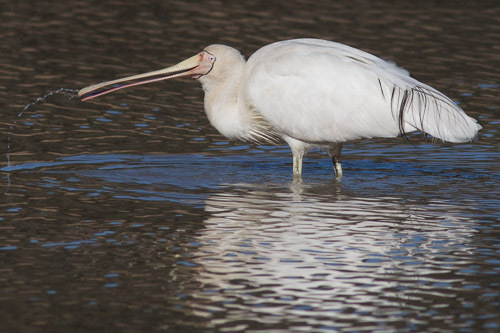 This Yellow-billed Spoonbill is in breeding plumage with a fine black line edging the pale grey facial skin, longer breast-plumes, and dark lacy plumes from the inner wing. I went to the Narrandera Commons first. It is a big chunk of bush right next to the Murrumbidgee River. I camped there overnight and slept under the stars. Very nice. In the afternoon I got one decent shot of a male Superb Parrot. Apparently it is there a bit early as I was told by the locals that they do not get here until September or October and they nest in November. 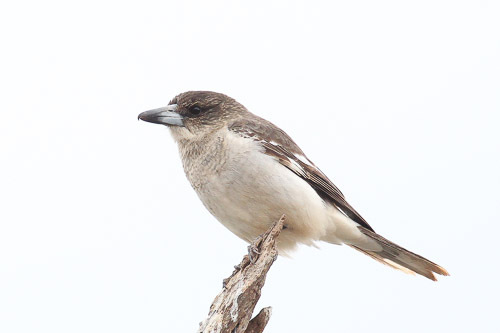 I think this is a juvenile Little Friarbird. 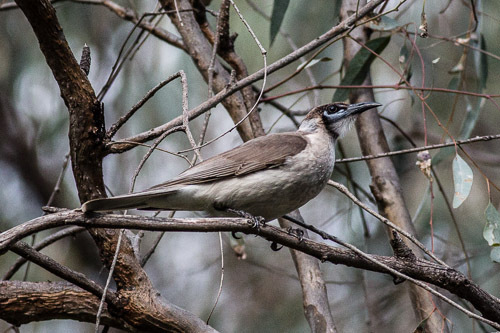 At first glance it is easy to mistake them for the Blue-faced Honeyeater but it soon becomes apparent what they really are. 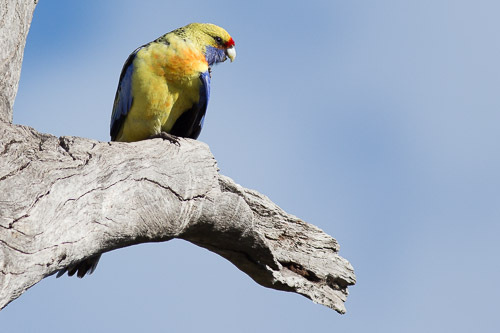 This is the Crimson Rosella, race flaveolus. 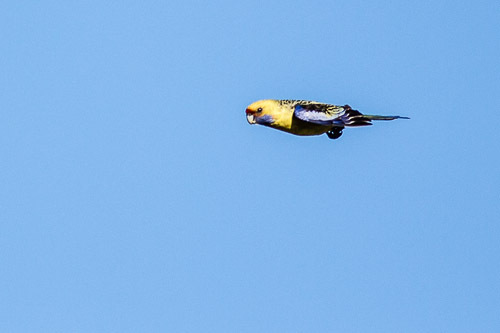 Commonly called the Yellow Rosella. They are quite common down south towards Victoria. They have a few other local names but I have forgotten them. doh! A Yellow-billed Spoonbill up a tree. I was going to say how unusual it was to see them up trees, but I think I remember seeing them heaps like this. 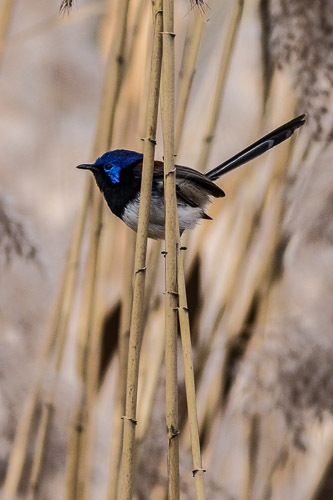 Some Variegated Fairy-wrens playing around in the bullrushes. Once again back to Fivebough Swamp. There was not much water and very few birds. 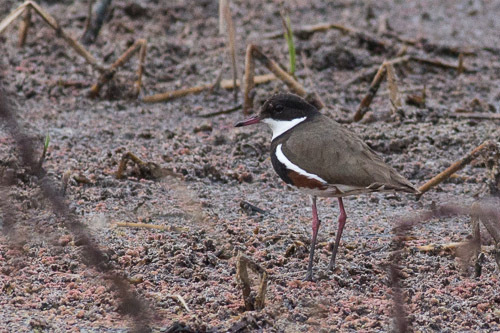 Luckily I got some shots of some Red-kneed Dotterels, which was good. 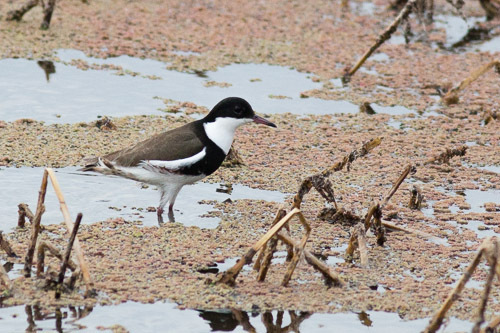 I thought they were Hooded Plovers at first but now I have had a good look at the book, I realised my mistake. doh! 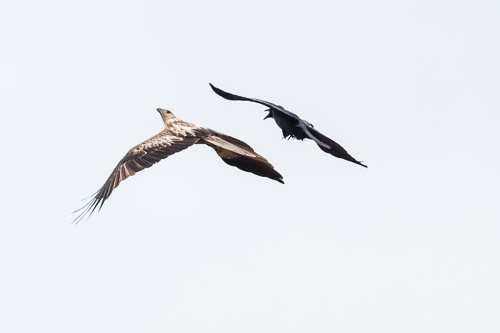 And a Whistling Kite was being harassed by a mob of crows. At last some photos of birds. 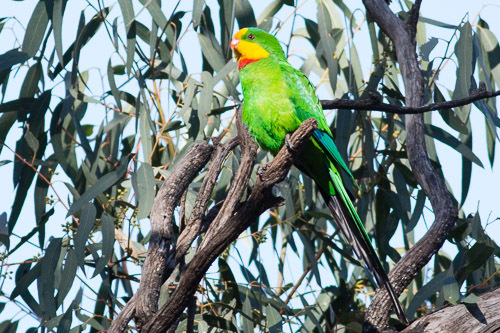 I had been waiting for ages to take some photos of the Australian Ringnecks around the parks of Griffith. I just never got the camera out at the right time. They seem to come around the main park in Griffith town and at the picnic area out at Lake Wyangan. 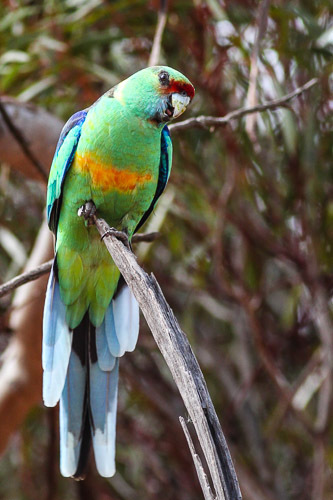 There are quite a few races of Australian Ringneck and the nominate race has a distribution around South Australia. 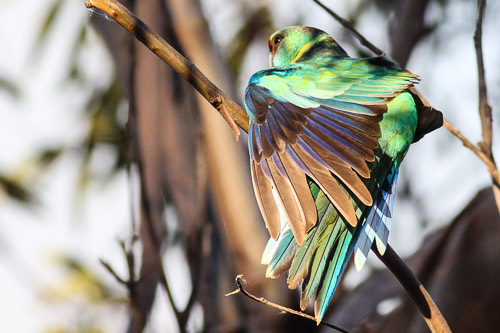 This one is the Eastern Ringneck or the Mallee Ringneck, race barnardi. They have a red patch above the eyes and a yellow band on the stomach, as well as a yellow band on the back. I got quite a surprise seeing this circling high up over the lake. 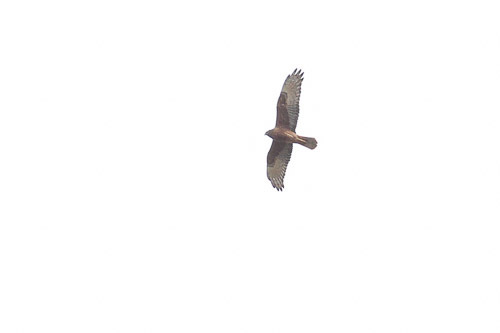 I thought it was a Whistling Kite at first but after a good look at the under wings and the patch on the face, I concluded this must be a juvenile Spotted Harrier. 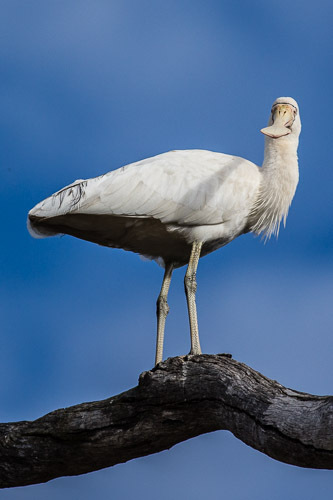 This is an immature bird.